Spaghetti Junction is 40 years old this month; having opened for traffic in May 1972. Its official name is Gravelly Hill Interchange and forms J6 of the M6 where it meets the Aston Expressway. 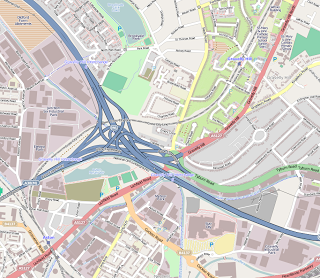 The name of Spaghetti Junction was coined by Roy Smith, a journalist on the local newspaper; and it is still the name by which it is known, much to the annoyance of officialdom. Now to many people in the world a junction of this scale and complexity is no big deal, but in 1972 it was an engineering, social and transport wonder to the population of Britain. After opening it was soon carrying 40,000 vehicles a day. Today it carries 5 times that volume of traffic and is subject to regular maintenance and strengthening to keep pace with the traffic flows. It took 4 years to build the 30 acres (12 ha) junction, which serves 18 routes by means of 4 km (2.5 mi) of slip roads. Interestingly the junction contains only 1 km (0.62 mi) of the M6 itself. Just to add to the complexity of the engineering task the junction sits atop of 2 railways, three canals and two rivers. The solution required 5 different levels, 559 concrete columns, reaching up to 24.4 m (80 ft) and a 21.7 km (13.5 mi) elevated section of motorway. It was similarly difficult to map it for OSM, so congratulations to the pioneer mappers who had this junction mapped in the very early days of OSM when there was not much more on the map of the UK than the coast and the motorways. The Aston Expressway (designation A38(M)) is also a transport oddity, being the only single carriageway motorway in Britain. It consists of 7 lanes and operates a tidal flow into and out of the city: more lanes into Birmingham in the morning and more lanes out in the evening. It is also odd amongst UK motorways in having a maximum speed limit of 50 mph. According to the Guardian newspaper, a poll of drivers nominated Spaghetti Junction as the most terrifying junction in the country, with many drivers opting for diversions of many miles in order to avoid it. To celebrate the anniversary Dunlop, the tyre manufacturer, based at nearby Fort Dunlop where it manufactures tyres for motor-sport, organised a ten truck convoy to converge on the junction from different routes for an aerial photograph marketing shot. Dunlop reckon they have shipped over 10 million tyres across the junction since it opened. Nice article! The A38(M) isn’t quite the only single carriageway motorway in Britain though: see here and here.